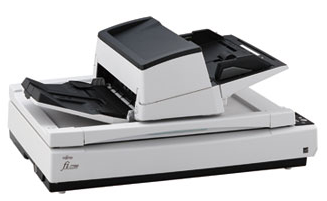 FUJITSU Fi-7700S allows you to scan A4 landscape documents at 75 ppm (200/300 dpi). The scanner is suitable for continuous scanning because it allows you to load up to 300 sheets at a time so as to increase efficiency when scanning large numbers of documents. In addition, various types of documents, such as thin paper, plastic cards, books, magazines, envelopes, and long page documents can be scanned on this scanner.